Explore people’s experiences of modern war from WW1 to conflicts today. The Imperial War Museum London tells the stories of those whose lives have been shaped by war through the depth, breadth and impact of their galleries, displays and events. With both large-scale hardware (including the two gargantuan naval guns before the entrance) and exhibitions on the social effects of war, the Museum now covers all conflicts in which British or Commonwealth forces had been involved since 1914 to present day. The museum underwent a major internal redesign and refurbishment and reopened in 2014 in time for the First World War Centenary commemorations. Visitors will be able to explore what life was like at home during the Second World War in A Family in Wartime, discover how war changed lives in the award-winning First World War Galleries, or see work by some of Britain’s most significant 20th Century and contemporary artists at IWM Contemporary. The historical IWM London museum displays both permanent and temporary collections on wide-ranging topics and themes from war art to modern day combat. A major exhibition coming up for 2017 is People Power: Fighting For Peace, where visitors will take a journey from the First World War to the present day, exploring how peace movements have influenced perceptions of war and conflict in this major exhibition. 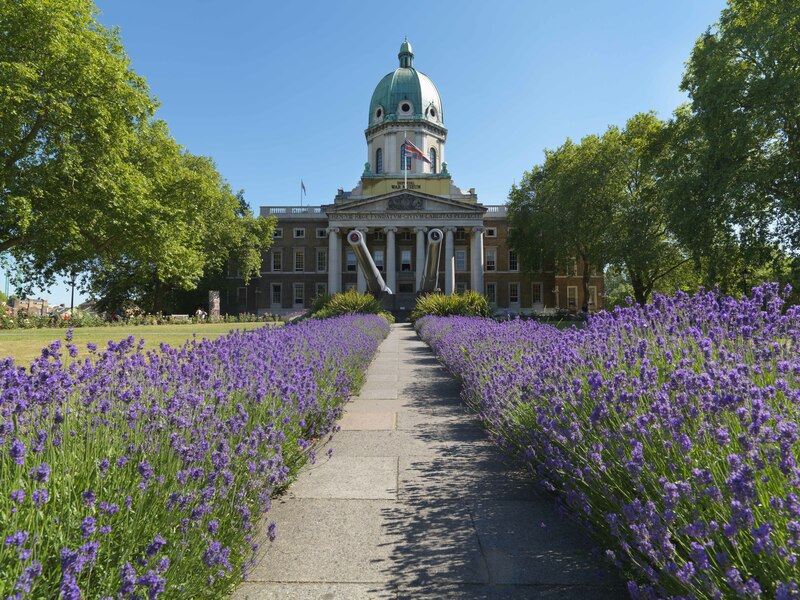 Once you've explored the fascinating museum, discover the beautiful grounds where IWM London is situated. Where the great hospital wings once stood is now the expansive Geraldine Mary Harmsworth Park, named after the mother of Viscount Rothermere. • Charge for some temporary exhibitions. The Café and Tea Room (peak periods and weekends) are open until 5.30pm and offer a wide choice of hot and cold food, juices and coffee. Three new shops selling bespoke gifts and souvenirs. Wheelchairs available to borrow for free, pre-booking required. All sorts of animals served in the First World War, from horses, dogs and pigeons to camels in the desert. Look out for a dog collar in our First World War Galleries worn by a messenger dog called Wolf! The IWM London Atrium and Terraced Galleries house a collection of large objects charting the stories of war up to the present day, including a V-2 rocket, a Harrier Jump Jet and a drone. The Lord Ashcroft Gallery showcases astonishing acts of bravery. See the Extraordinary Heroes exhibition, delve into the world of espionage in Secret War and explore key moments of the Second World War in the award-winning Holocaust Exhibition.